This Program is a Loyalty Plan offered by Trolley.ae to provides discount benefits for all customers in return of their shopping transactions. Customers will earn reward points that can be redeemed as cash discount worth AED 50 for every 500 points. 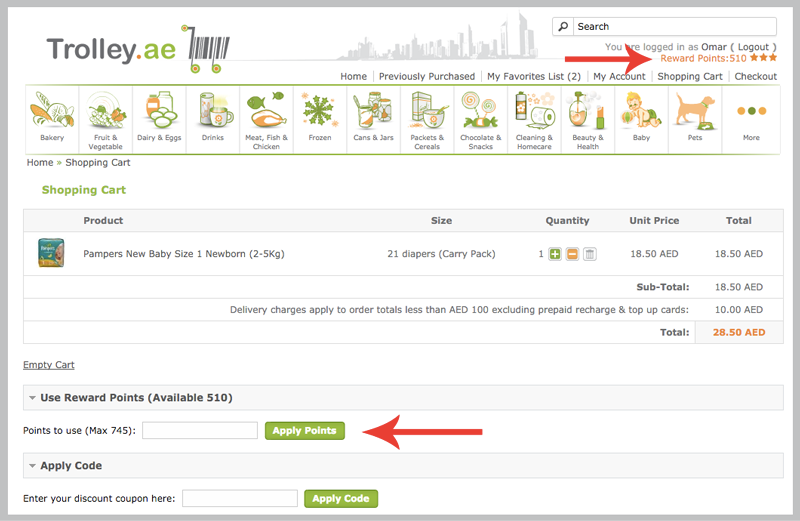 Earned point per product can be viewed at the shopping cart below the item description. Acquired number of points collected will appear in account details for logged in customers. Customers are eligible to earn points on spot when placing orders, and can use these points once the first order is completed and delivered. To use the points, first you need to login with your account. Do the usual shopping. And just before you checkout, go to your shopping cart and view it. You will see a small box just below the products list which you can use to apply the number or points you need to redeem for this purchase.